Looking for a sandwich that's a little different? 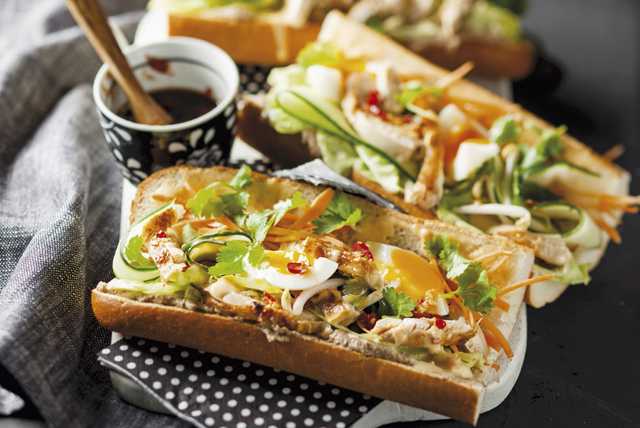 These flavourful easy-to-make bahn mi sandwiches are sure to please. The easy pickled veggies and grilled marinated pork tenderloin, served in crisp baguette pieces, make delicious sandwiches. Add vinegar to combined sugar and salt in medium bowl; stir until most the sugar is dissolved. Add vegetables; mix lightly. Refrigerate 8 hours. Heat barbecue to medium-high heat. Cook meat 18 to 20 min. or until done (165ºF), turning occasionally and brushing with barbecue sauce for the last few minutes. Remove meat from barbecue; cover loosely with foil. Let stand 5 min. Meanwhile, cut baguette lengthwise in half, being careful to not cut completely through baguette; cut crosswise into 4 pieces. Spread cut sides of baguette pieces with Miracle Whip. Drain vegetables. Cut meat into thin slices, then cut eggs into quarters. Fill baguette pieces with meat, vegetables, eggs and cilantro. For more authentic flavour, add thinly sliced jalapeño peppers and English cucumbers to the sandwich filling. Love spice? Add Sriracha sauce (hot chili sauce) to sandwiches to taste. The vegetables can be marinated up to 24 hours before using as directed.